On a trip to Essex earlier this year Dave and I took the opportunity to have our ‘D’ date. 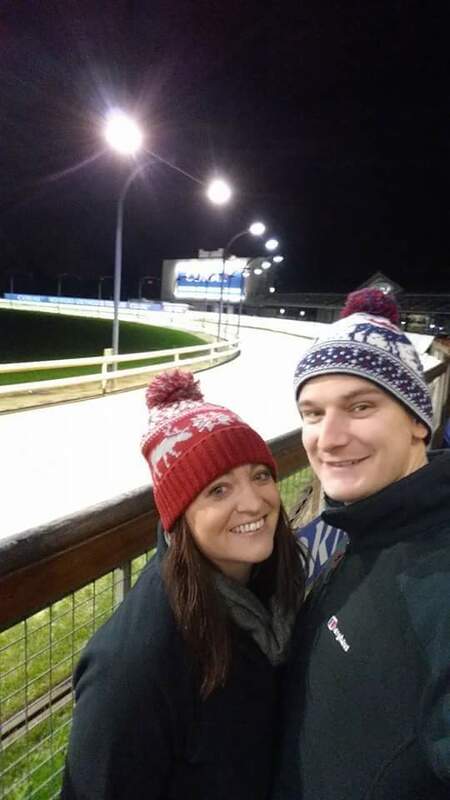 My Mum and Dad had recently had their first trip to Romford Dogs and highly recommended it so it pretty much made our mind up for us to go to the Dogs for the letter D.
I’ve never bet on anything like the dogs before so this was a totally new experience for me. Monday nights are free so after a 25 minute drive – we made our way in, pleased that we were staying true to our principle of trying to keep it cheap. 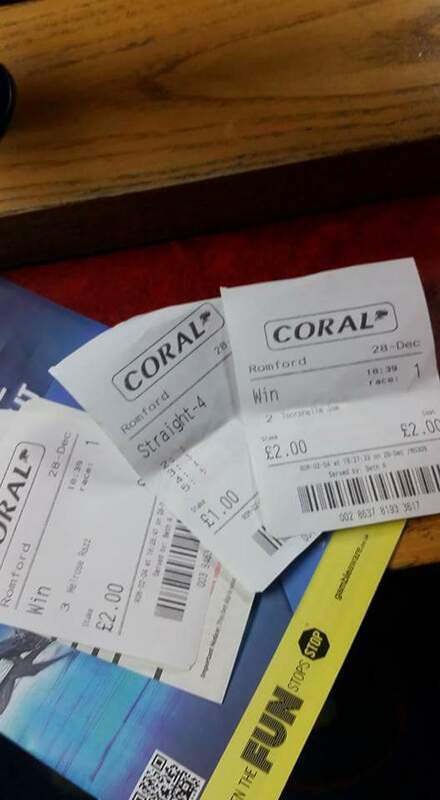 Knowing my dismal track record the few times I have bet I stayed brave with just betting £1 on each of the 15 races. 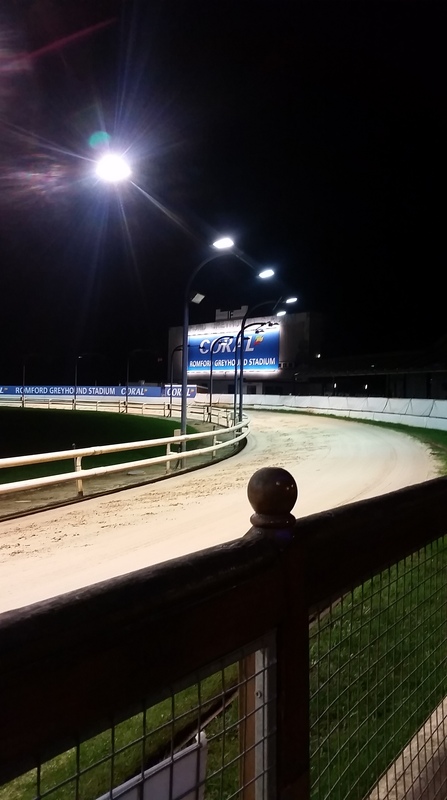 Just as well really since there is apparently no such thing as beginners luck with greyhound racing! I didn’t win a penny! 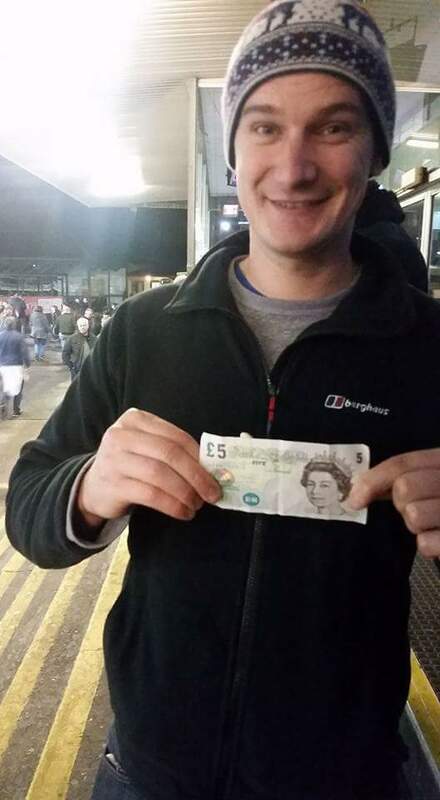 Dave on the other hand was slightly bolder, betting £2 per race and did win a couple so only came out about a fiver down. Feeling a bit peckish, we grabbed some food. It was highly amusing to see Dave’s reaction to how cheap the chips were. He walks around with this assumption that EVERYTHING down south is the outrageously priced so he was pleasantly surprised at the reasonably low cost. He wasn’t as impressed by the lack of gravy/curry sauce/peas/pea wet to go on said chips! Dave and some of his winnings! You get a real rush from watching the dogs and the sheer speed they go at. It’s truly an exciting evening! I met Lucy on 25th September 2006. Yes, 10 years ago, on my 20th birthday. I was going on a night out in Chelmsford with my friend Kayleigh and a couple of girls from Uni, and Lucy was on the cheerleading team with them. Like me, she was doing a law degree but was the year above. In the spirit of the more being the merrier, I was more than happy for her to gate-crash. If you’d told me on that day that I’d met the one person that I would still be in touch with 10 years later I would have probably laughed at you. Our friendship was cemented less than a month later when I found myself with a spare ticket to go and see Panic! At the Disco at Brixton Academy and she came along. Lucy is originally from Romford, just outside of London and lived with her Mum and Dad and sister, Sophie. I got to know Sophie just as well as I did Lucy, as I whiled away hours talking to them both as they worked in the Student Union shop. One of our countless trips to The Pink Toothbrush – I think this one is in 2007! My Mum and Dad adored Lucy. One of the few friends of mine that they actually liked, and even now they’re pleased to see her! As Lucy and I have grown together over the last 10 years (her birthday just a day short of two months before mine), the parallels we’ve identified between ourselves have been scary. They started off as mere coincidences, with our father’s both working as carpenter and joiners, to us both studying Law at Uni. In 2008 though, Lucy met her now husband, Adam, in London. I didn’t think anything of it at the time, but Adam is from Wigan. Until I moved to Atherton, I had no idea that Wigan was so close to Bolton (where I work. I never made the connection). After I moved, mine and Lucy’s friendship grew closer. Although we never really drifted apart, after Uni it was harder for us to see each other, but as soon as I moved, and discovered our mutual connection to Wigan we made so much more of an effort with each other. We caught up with each other with regular phone calls and Lucy came to stay with me a couple of times. I returned the trip, and when she and Adam bought their first flat in London I went to stop with her. She took me to see Legally Blonde The Musical that weekend which totally appealed to both of our legal, but quite girlie side. Eventually, Adam and Lucy were expecting the birth of their first daughter Poppy (also the name of my dog!) and needed to move into a bigger property. Knowing how much Lucy loved Rayleigh, I wasn’t surprised when she told me she was moving there. What did surprise me though was she moved onto a home on the estate built on the now knocked down office I had left behind. Sometimes I wonder whether I would have moved had Lucy moved to Rayleigh before I left there. To this day, we’re constantly amused by how we have both ended up with Wiganers. If you’d told us this would happen when we were at Uni, we would probably have asked “what’s a Wigan? !” It’s perfect for us, because we now have regular phone catch ups, but we also have the luxury of being able to catch up, both when she’s up visiting her in laws and when I’m down visiting my family. Even if it’s just a couple of hours over coffee. I literally would not change our friendship for the world – I’m a lucky girl to have such a loyal friend, that no matter how long I go without speaking to, will always be there for me and no matter how far away she is, it’s still only ever a phone call. Lucy’s Hen Do – October 2015! ​After the disaster of our C date, I was determined to redeem the situation. Many people, including Dave, didn’t believe we could have a second stab at our C date. But hang on! My game, my rules! I was hell bent on a new C date. I’ve always had a bit of a thing for going to see TV shows being filmed. Over the years I’ve been to see Trisha being filmed (twice), Top Gear, Russell Howard’s Good News (three times) and recently I’ve been to Britain’s Got Talent. Since moving to Manchester I’ve regularly been trying to get tickets to see Cats Does Countdown, but to no avail. As luck would have it, Kat, who I work with, has been successful in getting tickets on a number of occasions and it so happened in October, she received them again. She couldn’t make it though so this time sent them my way. It was just what we needed! Another C date! We arrived at media city in Salford on the day, what I thought was quite early. There’s no guarantee of getting in and Dave and I were lucky to make it. There were loads of people before us. We were allowed into the studio and ended up with pretty naff seats. We could see Jimmy Carr, Jon Richardson and Sean Lock but no sight of Rachel Riley and dictionary corner at all. But our luck was about to change. One of the runners came and asked us if we were there together and would we mind splitting up for better seats. Shamefully I didn’t even consider Dave and just jumped at the chance (Dave since told me he was fine with it as it’s not like you can talk anyway). It was a shame we weren’t sat together but it didn’t change how hilarious and what a fab experience it was. Our guests were Roisin Conaty and Jason Manford. In dictionary corner we had some hilarious Aussie dude who had just weeks before won the Perrier award at Edinburgh fringe. Jimmy Carr, is one funny funny man. I really admirer that it’s not all about him and he’s actually surprisingly down to earth. Meeting back up with Dave after, we were both knackered and hungry but in high spirits and both agreed it had been a fab experience. We both agreed over a McDonald’s that we couldn’t really count this as a C date because we didn’t get to sit together so looks like we’re leaving Coniston (the Craply planned one) as our effort for C!